At this time of year our mail-outs would usually be encouraging our clients to consider the approaching great crested newt (GCN) season, but having recently attended a Natural England (NE) meeting to discuss the release of district licensing; perhaps the forthcoming season (in Kent at least) will be less about muddy boots, torching and early morning bottle trapping and more about area calculations, cost risk assessments and potentially eDNA water sampling. Clients will have the option to choose between district licensing and traditional survey/licensing route. Should district licensing be the chosen option, the choice of either (a) submitting the application with survey data (eDNA sufficient) or (b) submitting with no survey data, will be available. Where survey data is submitted, a multiplier will be applied, with a different metric applied to whether a pond is occupied, unoccupied or un-accessed. Where no survey data is submitted, the metric will assume all ponds within 250m are occupied by GCN. Alterations to the metric will be made to account for NE determined Risk Zones (Red, Amber, Green), these zones having been identified due to their occupation by GCN. Having chosen the data/no data route, the application boundary and associated enquiry form will be submitted to NE for the metric to be applied (no fee). NE will calculate the impacts and costs associated with the development and then provide the fees required to off-set the calculated impacts to GCN. The calculation is currently based on the cost to construct, enhance and monitor a compensatory pond, where the loss of a pond is calculated through use of the metric. If agreeable, the applicant will sign an associated contract and NE will issue an Impact Assessment and Payment Certificate (IAPC) to be submitted with the planning application. The IAPC will be sufficient for the associated authority to relieve their concerns regarding GCN licensing and mitigation. When planning is approved (and all wildlife related conditions are discharged) the calculated fee + £700.00 admin will be submitted to NE for processing. NE estimate 28 working days to process payment. Once the payment has cleared NE will commence a 30 working day processing of the licence. Once the licence is issued, works can commence with no further consideration to GCN required. With the GCN season just around the corner, the scheme has yet to be released and NE have been known to miss deadlines. The scheme considers all waterbodies occupied (or assumed occupied) by GCN within 250m of a site as lost, even when they are not. In certain areas of Kent this could be costly and may skew any economic benefit. 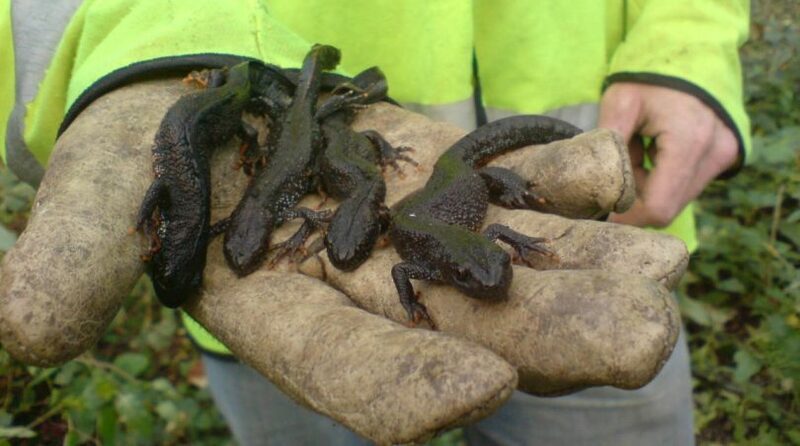 The scheme only considers GCN and should other protected species exist within a site (specifically reptiles) seasonal constraints, fencing, trapping and mitigation land will still be a lawful requirement. Planning policy/EIA obligations may require assessment of ponds to determine net-gain requirements, irrespective of the availability of district licensing. although yet to be confirmed, as all ponds within 250m are considered by the metric as lost, ponds known to support GCN may become available for attenuation purposes. Although selected due to their known lack of reptiles, GES have run hypothesised calculations for some of our existing sites and although significantly greater than the £15,000 estimated by NE, the financial savings in fencing alone have made the district licensing a route of preference in these instances. I guess the big question is; will district licensing remove the need for GCN surveys and associated licensing requirements in Kent? For a while at least, I believe it’s likely to be another ‘tool in the GCN box’. For some sites this is clearly going to be the chosen option, but I’m quite sure there will be many (most likely the smaller developments within high pond density areas) where the traditional licensing route will remain the most viable route. With so many twists and turns it’s become an interesting subject to keep up with, but if there’s one thing we can be sure about, its that 2019 will make for another interesting year in the world of ecology and all at GES are very much looking forward to the exciting times ahead. Header image credit: Guy Newman. About the Author: Guy Newman BSc (Hons) MCIEEM (Company Director & Principal Ecologist) – having founded Greenspace Ecological Solutions in 2011, Guy’s vision of building a dynamic, multi-disciplined team that delivers high-quality services across a range of sectors, was perhaps realised when the Chartered Institute of Ecology and Environmental Management (CIEEM) awarded the company its Small Consultancy of the Year Award in 2018. After a life-long passion for ecology and a long career within the UK utilities industry, his return to study at the Durrell Institute for Conservation and Ecology (DICE, University of Kent) provided the combination of commercial insight, project management and ecological background vital for the provision of sound ecological advice across a range of sectors. The holder of various Natural England licences and also a registered consultant under the Natural England Low Impact Class Licence (LICL) scheme for bats, Guy regularly produces European Protected Species Mitigation (EPSM) development licences and authors comprehensive Management Plans, Ecological Impact Assessments and Protected Species Mitigation Strategies. A full member of CIEEM, Guys passion for planning and protected species has enabled the company’s consultation to bridge a range of disciplines including commercial and domestic developments and the renewable energy and infrastructure sector. By his own admission, the application of these passions perhaps never more rewarding than when applied to the Church, Historic Building and Parkland restoration projects for which the company’s involvement is key. Guys passion for the industry has enabled his team to thrive on the building of strong client relations, the provision of great customer care and the mentoring of the industry’s future generation, who’s journey into work-based ecology has come at something of an historic time.